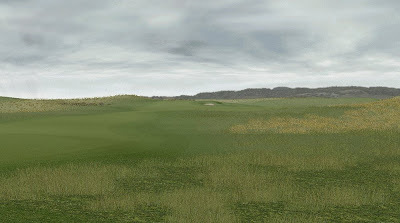 Here's an overview of the par 4 3rd, heading inland and playing relatively short at 408 yards from the back tees. 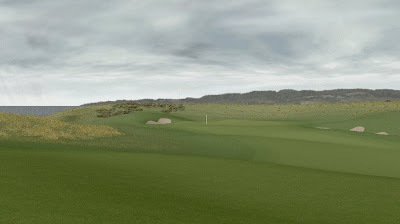 The view from the tee to the wide open fairway can be quite deceiving as the player must choose to play left or right of 2 deep bunkers right in the middle of the fairway. Play left and you're rewarded with a clear view for the approach shot to the green (2nd picture). Play right and you can add extra yardage down the hill to your drive but have a semi-blind approach. The green slope from back to front.